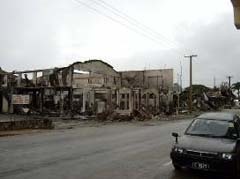 Two weeks after riots destroyed 80 percent of the business district of Tonga’s capital city, Nuku’alofa, World Peace Tour IV came to the Pacific island nation. The keynote speaker, Rev. Jessie Abram Griffin, founder of True Vine Missionary Baptist Church in the USA, arrived safely early that morning. In spite of the many challenges faced during preparations, the December 2 event brought a revival of spirit and hope. 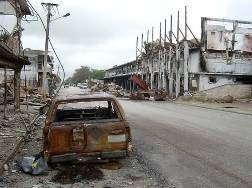 Soon after the riots, King George Tupou V issued a declaration of emergency effective for at least 30 days. 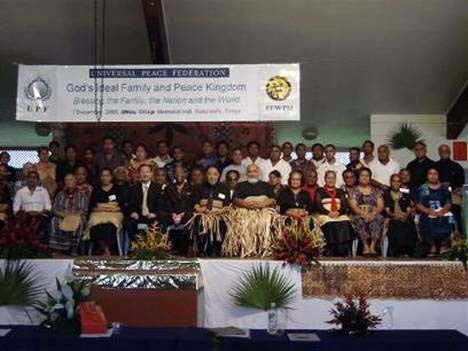 Under these circumstances, official permission was needed from the Tonga Defense Service to hold the event. Rev. Griffin’s flight was delayed one day due to mechanical problems on the airplane. As a result, phone calls had to be made to all the invitees informing them about the change. On the day of the event, about 60 people turned up. The World Peace Blessing ceremony was conducted and concluded with the blessing benediction offered by Rev. Griffin. As soon as the whole program finished, Rev. Griffin had to rush to the airport. Many participants stayed afterwards for a time of sharing and refreshments. We could feel from Rev. Griffin that he missed his family so much, since he had left them almost three weeks ago when he began the tour. We are grateful to him for bringing blessing and hope to Tonga at this time.